Hand-pressed glass is completely fabricated by hand operations. 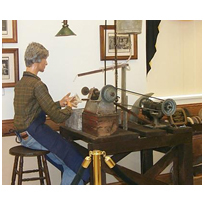 Machine-pressed glass is produced by automatic methods and mechanical equipment. 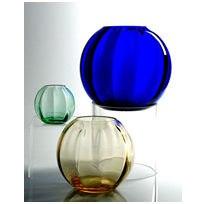 Off-hand blown glass is produced by an expert blowing without the aid of molds. 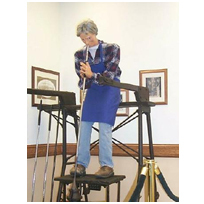 All finishing and polishing is done by highly trained craftsmen. 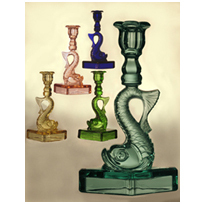 Hand-blown glass is always mouth-blown and is completely fabricated by hand. Molds are frequently used, and expert workmanship is required. 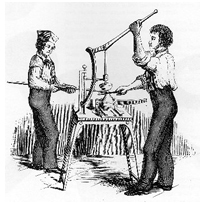 This is the method used by A. H. Heisey & Co.
Machine-blown glass is fed into molds by an automatic feeding device and is shaped by compressed air. Etchings are produced by using strong acids to “eat” the designs into the glass. Some etched designs are imitated by “sandblasting” or decorating with enamel paint. Plate etching is produced by engraving a design onto a metal plate. The plate is inked, then the ink is transferred to a paper made especially for etching. This paper print is fitted to the article to be etched and the ink is firmly pressed against the glass. When the ink is transferred onto the glass, the paper is removed. Except where the design is to be etched, the glass is covered with beeswax. The glassware is then submerged in acid, which eats the exposed glass. After the wax is washed off in hot water, a silver-gray plate etching results. Needle etching is produced by a machine that activates needles, which trace the desired design through wax or protective film. The film is applied so that part of the glass is exposed. The glass is then placed in contact with acid, which eats the design into the glass. The wax is then removed. 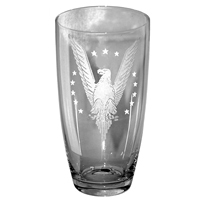 Engraving on glassware is done by cutting out a pattern by hand using revolving copper wheels, stone, or other abrasives. The decoration is usually left a gray color. Sand carving is a modern process of sandblasting or using other abrasives to create a design through a mask on the surface of the glass. This produces a gray satin finish. 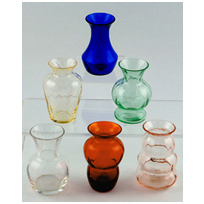 Frosted effects are produced on glassware by exposing all or part of the glass surface to acids. Or, they can also be produced by applying adhesive to all or part of the glass surface. Powdered glass grains stick to the adhesives and are later “fired on” permanently. 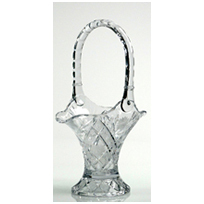 Sometimes a frosted effect is produced by sandblasting or by applying a matte finish by using a brush or spray. Color is produced not by dyes, but by various mineral salts. Simulated color is sometimes produced by spraying chemical paint, which is then fired.